The Lunchbox Acoustic is ZT’s first two-channel amp, a compact masterpiece with perfect features, flexibility and tone for the performing acoustic musician. A top quality, dedicated microphone channel and separate instrument channel each sport the individual controls you need and the rich tonal palette you want. Complemented by 200W of clean amplifier power, anti-feedback circuitry, a pro-grade reverb and highly flexible signal I/O, the Lunchbox Acoustic is your affordable, one-box performance solution for the home, the club, the café or the recording studio. The original ZT Lunchbox took the music world by storm, and proved that our unique amp technology can pack an amazing amount of sound into a tiny, reliable, and attractive package. Now, with the Lunchbox Acoustic, this level of performance is available for working singer-songwriters, vocalists and demanding acoustic players of all styles. The Lunchbox Acoustic is easy to carry and easy to use, but provides plenty of clear, natural, room-filling sound when you need it. Designed with logical simplicity but able to adapt to each unique environment, instrument and individual voice, the Lunchbox Acoustic offers the features you need to get the very best out of real world performing situations. 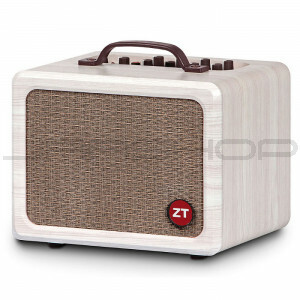 The Lunchbox Acoustic holds a down-to-earth visual appeal, yet remains unmistakably ZT. That little red circle on the front lets you know you’re looking at a uniquely powerful compact amp. Like the original Lunchbox, unmatched in its combination of performance, portability, it is sure to become the best friend of working musicians everywhere.